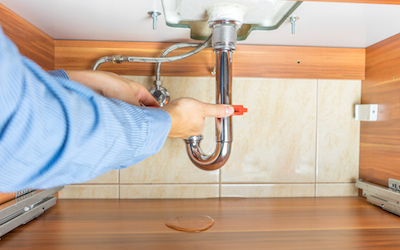 Check and repair any faucet leaks. One drip each second wastes almost 9 gallons/day. To determine if you are wasting water in your home: Check your water meter at the beginning and end of a one-hour period when you are not using any water. If the reading increases, you are wasting water somewhere in the house. Turn off the tap while brushing your teeth or shaving and save 10-20 gallons of water. Newer toilets use up to 4 times less water than older models. For older toilets (before 1992), place a water-filled plastic bottle in the tank to use less water. Check the date stamp under the lid of the toilet. To determine if your toilet is leaking: Put a few drops of food coloring in the toilet tank. After 30 minutes, if the water in the toilet bowl changes color you have a leak and need to repair it. Replace or retrofit showerheads and sink faucets with water-saving devices such as aerators or spray taps. Run dishwashers and washing machines only when filled to capacity and set to use the least amount of water (i.e., "water miser" or "small load"). Dishwashers use less water than washing dishes by hand. Water plants with old fish tank water. It’s great for the plants. 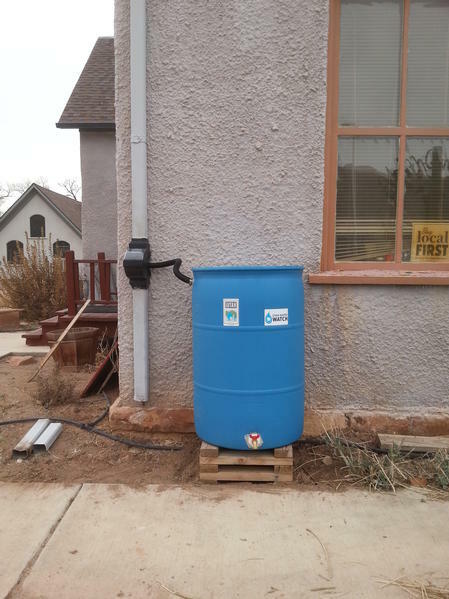 For most uses, 50 gallons/person/day is sufficient. Check your water meter or water bill to determine how much water is being used. Take shorter showers or, if bathing, fill the tub only halfway. Reuse faucet water by keeping a plastic bowl or bucket in the sink for watering plants or the lawn. Go to H2ouse to calculate how much water your home uses and determine what you can do to save water in your home. Request a sprinkler system audit from your local utility, usually offered as a fee service, to determine how to water more efficiently. If you water with sprinklers, water early in the morning to avoid evaporation. Insure that water is not applied to the sidewalk or driveway. Use a hose with a shut-off valve to control the amount of water used. Instead of hoses or sprinklers, use buckets to water small gardens, plants, trees and shrubs to control how much water is applied. Reduce runoff; porous surfaces such as gravel can be used for driveways and sidewalks instead of concrete. Check your sprinklers using Center for Water Efficient Landscaping guidelines. 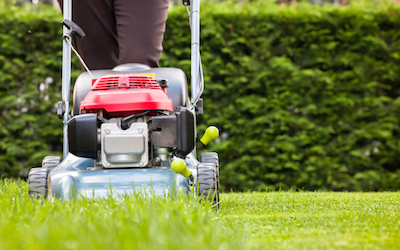 Try to shrink your lawn by 5 percent each year beginning with areas difficult to mow, replacing grass with flowers and shrubs. To conserve water and keep your lawn healthy, wait as long as possible in the spring to water your grass. Keep lawns about 3 inches long so that the grass can shade itself, requiring less watering. 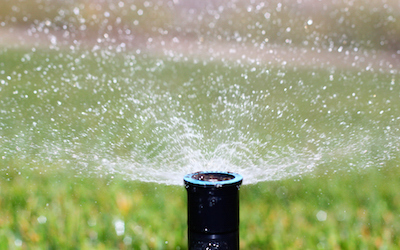 Water your lawn every third day, for 15 minutes at a time. Try watering with soaker hoses or trickle systems. Avoid oscillating sprinklers or sprinklers that produce mists or sprays. You may save 20-50 percent of the water used by sprinklers. Plus, deep watering systems keep roots strong and prevent plants from drying out. Lawns are generally overwatered. Grass should lie flat and show footprints when stepped on before needing to be watered. Use compost instead of chemical fertilizers and organic methods of pesticidest control instead of chemical pesticides. One idea: pureed and strained hot pepper mixed with water and a drop of dish soap sprayed onto plants can repel many different kinds of insects and even squirrels. Soil erosion at a construction site can add high levels of sediment to a stream, especially after a storm. Assess the erosion and sediment control at the construction site, stabilize exposed soils and drainage ways; protect waterways and steep slopes and cuts. Be aware of proper hazardous waste disposal days and locations to dispose of oil, antifreeze, gas, and paints. Don’t flush the toilet to dispose of tissues or other trash. To avoid fertilizer runoff, don't fertilize your yard if rain is expected within 24 hours (unless the fertilizer is activated by rain). Generally, fertilizer application in the fall has less impact than in spring or summer. Spilled oil, gas, and other toxic substances will end up in the water; be careful when you handle toxic substances at home or while boating. When constructing, leave as much vegetation as possible until you are ready to landscape. Sweep sidewalks and driveways instead of cleaning with the hose to save water and prevent pollutants from washing into the stream. Use mulch over soil to prevent evaporation from the soil. Mulch also prevents erosion, cuts down on weed growth, and adds nutrients to the soil. Spread cat litter over oil leaks. After the oil is absorbed, sweep the cat litter and dispose it with your garbage. Do not clean your car engine at home. Take it to a commercial car wash facility. Avoid caustic toilet cleaners (such as tank tablets) which alter the water's pH, damage toilet parts, and cause leaks. If buying a washing machine or dishwasher, make sure that it meets EPA standards for water and energy conservation demonstrated by the green "Energy Star." These models also save money in lower bills. When washing cars, use buckets instead of the hose. Wash the car on grass to absorb runoff, but use a phosphorus-free cleanser. Baking soda, distilled white vinegar, lemon juice, and ammonia can be used as alternatives to many toxic chemicals. Don't dispose of solvents, paints, medication, nail polish remover, varnish, or other toxins in the toilet or sink. These chemicals can end up in the stream. Rule of thumb: if it could hurt a fish, don’t put it down. 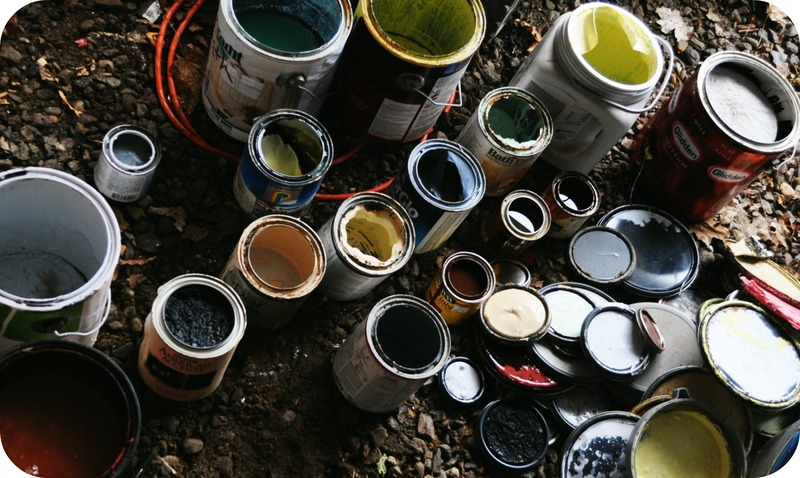 Find out about community hazardous waste days and locations. Prevent trash, lawn clippings, leaves, and automobile fluids from entering storm drains. Avoid using the hose or leaf blower near storm drains. Many homeowners over-fertilize their lawns. Runoff from fertilized lawns increases in-stream nutrient levels. Test soil to determine the necessity of fertilization. USU Analytical laboratories can conduct soil tests. Measure the area of your lawn to determine how much lawn care product you need to apply to avoid over-fertilization. Consider installing a secondary water system to use untreated or "recycled" water for watering the lawn. Lawns should be landscaped so that plants and grass absorb runoff from roofs. Or, direct runoff and gutters toward trees or shrubs. 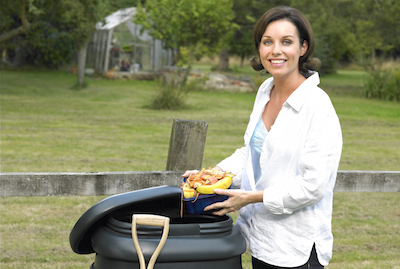 Garbage disposals contribute suspended solids and organic material to wastewater. Do not put fats, grease, coffee grounds, paper towels, sanitary products, or powder detergents down your disposal. Don't bag grass trimmings; allow them to act as a natural mulch for the soil, helping retain moisture and nutrients, also saving time, energy, and landfill space. For deicing, use calcium chloride instead of rock salt. It contains fewer pollutants and requires a lower application rate. Insure that your septic system is operating properly. Tanks should be checked and cleaned every 3 to 5 years. What is inappropriate in a septic system? Grease, solvents, chemicals, and medicines. Stormwater should be routed away from the septic system. Be informed of your septic system: where it is located, how much and what type of land is necessary, and what is appropriate to allow into your septic system. Prevent livestock from directly entering streams. Maintain riparian zones in farmland to help prevent erosion and sedimentation, but keep livestock from entering these areas. Plants on creek beds help prevent erosion and provide shade for fish and other in-stream species. Consider selling manure to other farmers, for compost, or for power generation. Livestock waste adds high nutrient levels to the water. Try modifying feed to reduce nutrient levels. On lands where manure is applied, try to reduce soil movement by conservation practices such as tillage, crop residue management, and grazing management. Take part in the Utah Water Watch program. Help stencil storm drains to alert people that water in storm drains goes directly to the stream. 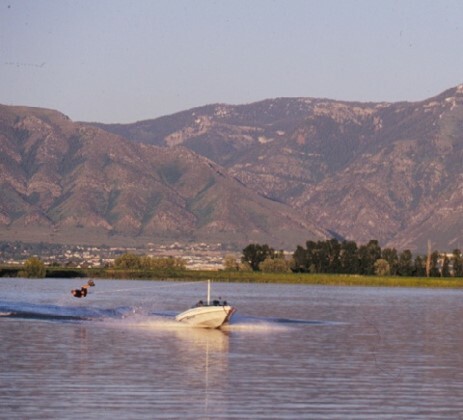 When boating, avoid shallow areas as motors increase sediment in the water. When walking your dog, collect the waste and properly dispose of it by putting it in the trash, flushing it down the toilet, or burying it at least 5 inches deep. 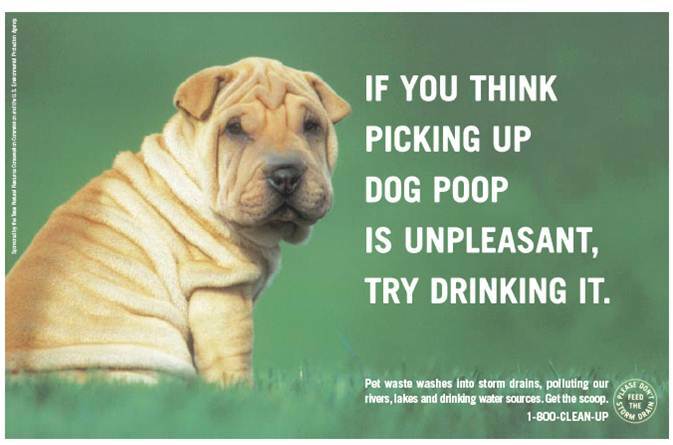 Pet waste contains viruses and bacteria that can contaminate surface and groundwater. Properly dispose of fish guts and other animal waste away from the creek or wetlands else it will foul and cause undesired bacteria growth.